The new Toy Range features over 40 cool and quirky Moshling characters to collect! Will you find the Ultra Rare and Limited Edition Super Moshlings hidden in eggs? You can play games with your Moshlings and eggs! Look out for the Free Digital Gifts in each set that unlocks content in the free Moshi Monsters Egg Hunt game. How many figures come with each pack? The number of Moshlings you get depend on the pack you purchase. It should be clear how many Moshlings come with a 1 pack, 4 pack and 7 pack! 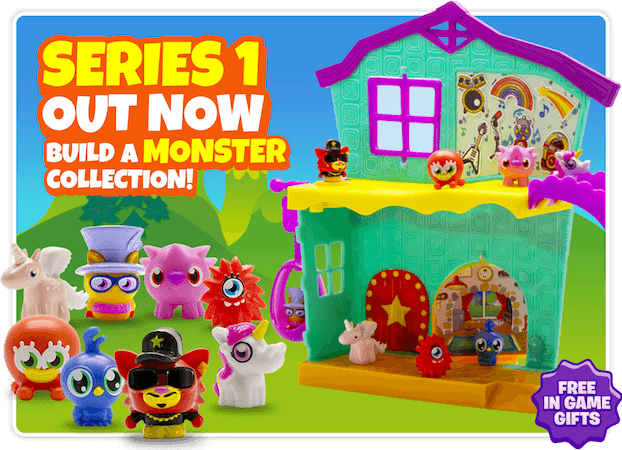 The Monster Pack comes with 17 Moshlings and Blingo’s Party House playset comes with one exclusive Moshling (Blingo)! What is the difference between the treasure chests? Each pack comes with a one time use code. Scanning this in game gives you a treasure chest that unlocks items in the Moshi Monsters Egg Hunt game! The type of chest you get depends on what toy pack you have. The bigger the pack, the fancier the chest and the greater the gifts you’ll find inside! Available treasure chests and the toy packs they come with are listed below. How many figures are there to collect? Series 1 has 41 figures to collect. 21 different Moshlings and 20 special translucent versions of Moshlings. Can you collect them all? How do I scan my code and unlock my Treasure Chest? To unlock your Treasure Chest, open the game and tap the Treasure Trove (the Treasure Chest in the bottom left of the map). If you are doing this for the first time, the game will ask for permission to access your device’s camera. After watching a short tutorial on code scanning, your camera should activate automatically. If you do not see this message and your camera is still not enabled, you will be able to activate it in the system settings of the device you are using. Don’t have the game yet? Download it now. Make sure that your game is up to date and on version 3.9 or higher! Will the codes unlock Moshlings in game? Whilst all the Moshlings you’ll find as figures can be unlocked in game, you cannot unlock Moshlings from these codes. Buster thought it might not be a great idea to keep Moshling eggs in Treasure Chests! If I have a query about my toy I have bought?